November 10, 2017, 3:00 p.m.
78% of women and 60% of men say sexual harassment in the workplace is a serious issue. The latest outpouring of news stories about sexual harassment in the workplace reflects a common experience for many American women. In the latest Economist/YouGov Poll, 60% of women report having been sexually harassed by a man. 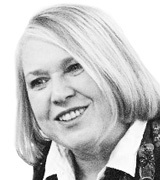 A third of those women report the harassment occurred in the last five years. For most women, sexual harassment is serious and not unusual – and the problem isn’t getting better. The recognition that harassment occurs is widespread. When women are asked what percentage of women they believe would say they have been harassed, the average response is 70%. Men are less likely to see the problem as that widespread: their average response is about 50%. Still, most people, male and female, say sexual harassment in the workplace is a serious problem. But for women it is a greater concern: 78% of women say sexual harassment in the workplace is a serious problem today, and 33% of women say it is a very serious problem). 60% of men agree it is a serious issue, with 21% calling it very serious. While 60% of women report they have been sexually harassed, even more (70%) say they have been discriminated against or treated unfairly because of their gender. And nowhere near all those instances of discrimination were reported. Just one in four who experienced discrimination or unfair treatment reported it. Whatever their own experience, Americans believe the problem continues. Only one in ten believe that sexual harassment is no longer a problem in the US. Fewer than a third say sexual harassment has become less of a problem in the last 20 years. More than half say the situation hasn’t changed or has even gotten worse. There are party differences in perception, but not experience. Republican women are just as likely as Democratic women to have experienced sexual harassment and discrimination based on gender. 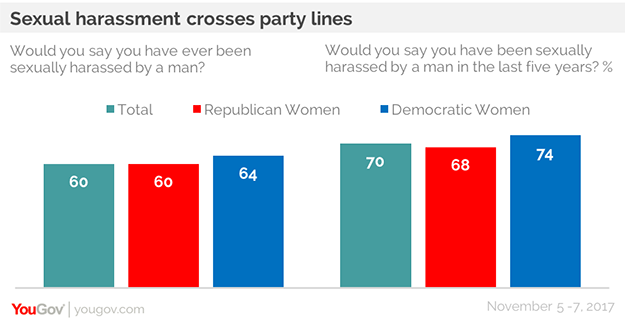 However, Republicans are less likely than Democrats to say sexual harassment in the workplace is a serious problem in the United States – and that’s especially true among Republican men. Democrats – both men and women – are more likely to describe workplace harassment as a very serious problem. But there are big differences between Republican men and women. Seven in ten Republican women say sexual harassment in the workplace is a serious problem; less than half of Republican men agree. If there is any backlash to the multiple recent allegations of sexual harassment, it may be among those who think that false allegations of sexual harassment present a bigger problem than sexual assaults that go unreported or unpunished. Overall, just 13% of the public view false accusations as a bigger problem than unreported or unpunished sexual harassment. Just 17% of all men agree. But among Republican men, that figure jumps to 28%. Although few GOP men say sexual harassment is no longer a problem, more than four in ten would agree that women who complain about sexual harassment cause more problems than they solve. That’s a statement most Americans disagree with. In the wake of recent allegations of abuse made against Kevin Spacey by a number of young men, it is important to note that sexual harassment by men is not limited to women only. 16% of men in this poll report that they have been sexually harassed by men, and, as in the case of women noted above, most abuse took place more than five years ago. Men who identify as gay or bisexual are more likely than men who identify as heterosexual to report they have been harassed by another man. But, just as more women in this poll report discrimination or unfair treatment because of gender than report sexual harassment, more men say they have been discriminated against than report being sexually harassed. 36% of men say they have experienced discrimination or unfair treatment, but for these men, as many report that they have to “watch what they say” as to report that discrimination affected their hiring, pay, or promotion. For women who report discrimination, the biggest negative experiences came in hiring and pay, gender stereotyping, and not being viewed as intelligent or having their opinions ignored. For more results, visit the full tab report or toplines.